Chimney cakes are made of soft yeast dough, wrapped around a wooden cone or cylindrical mould on the end of a spit and baked rotisserie-style over hot coals in a fire pit, in the intense heat of a barbecue or in a special oven designed for the job. If you've never tried Transylvanian food, head to Victoria Park for some chimney cakes. The sweet and savoury tube and cone-shaped cakes have eastern European origins. They are made of soft yeast dough, wrapped around a wooden cone or cylindrical mould on the end of a spit and baked rotisserie-style over hot coals in a fire pit, in the intense heat of a barbecue or in a special oven designed for the job. Yadira and Guillermo Rivas first came across chimney cakes at a mall kiosk in Saudi Arabia. Their kids loved them and the family would get them as a special treat every weekend. The couple met while working at BP — he was an engineer, she was in finance. 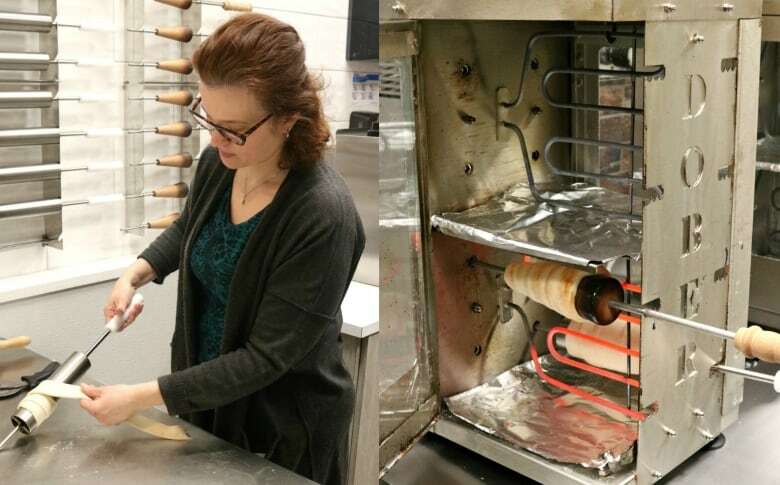 Their careers brought them to Venezuela, Calgary and Saudi Arabia, but when a dream job turned out to be less than dreamy, they pondered bringing chimney cakes to Canada. The couple explored the business concept to the point where Guillermo traveled to Budapest, where chimney cakes are a popular Hungarian street food, to learn how to make them from scratch. When the Rivases eventually returned to Alberta, they found Calgary in the midst of the economic downturn and it was difficult to find jobs. 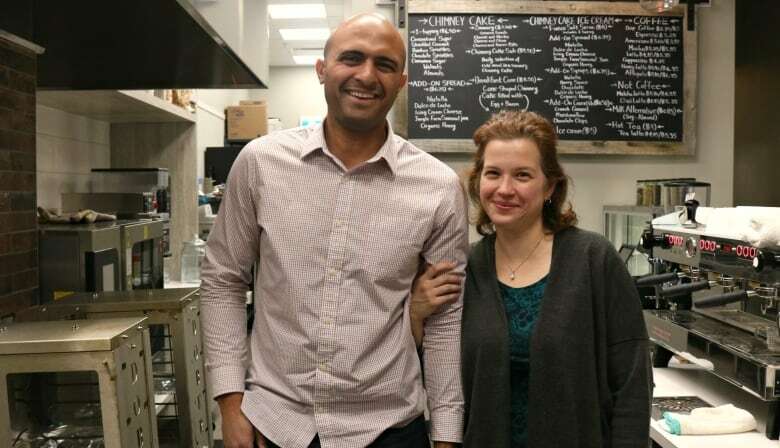 "When we came to Calgary we had Plan A, B and C. This was Plan B that suddenly became Plan A," says Guillermo of their new chimney cakes and coffee house. "And until this past February I knew nothing about coffee, so I went to Vancouver to train to be a barista and become certified." Knowing Calgary is supportive of small businesses and open to new food ideas, they opened in a new building in at 207 13 Ave. S.E., with branding done by a designer they knew in Venezuela. Utca — pronounced ootsa — translates to "street" in Hungarian. Yadira and Guillermo make the dough themselves and bake the chimney cakes one at a time in ovens imported from Slovenia. The dough is coaxed off their moulds while they're still warm enough to release their trademark wisp of steam, making them resemble a smoking chimney. The sweet ones are brushed with a little oil and sprinkled with sugar before baking for a slightly crunchy, caramelized exterior. The savoury cheese chimney cakes are filled with ingredients like scrambled eggs, sausage and cheese for a breakfast you can eat out of hand, perhaps with a latte made with beans from nearby Rosso Coffee Roasters. 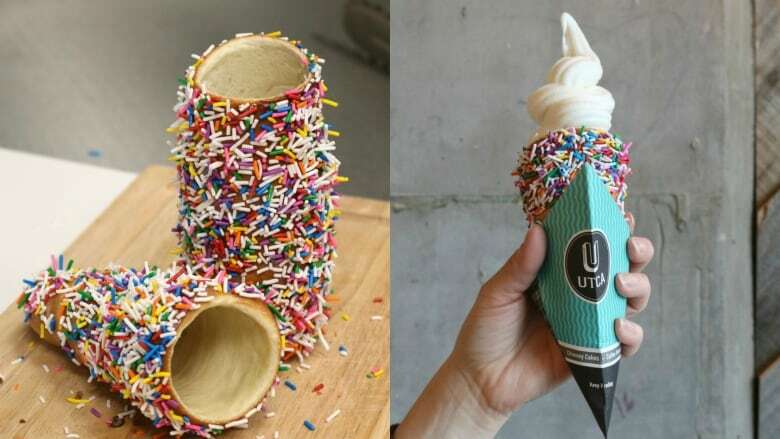 The most popular cones at Utca are rolled in sprinkles, coconut or other flavoured coatings, then filled with a variety of sweet additions, like caramel drizzles or Nutella spread before swirling in chocolate or vanilla soft serve from Fiasco Gelato. 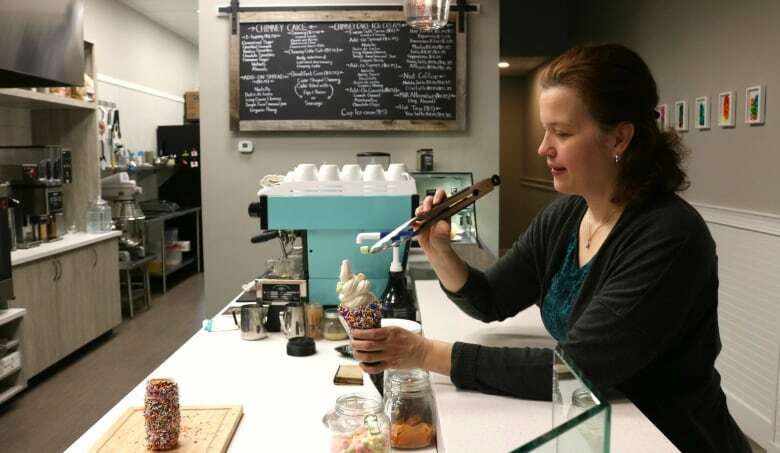 "It's a bit more expensive than if we just got any kind of ice cream, but it's especially important to us right now to work with local small businesses, and keep the money circulating within our own city," Guillermo says. When you come into Utca, there's a high communal table and cozy banquettes along one wall. They offer the option to wait a few minutes for a warm, freshly baked chimney cake, or choose from a few that are ready to go and already cooled down. "It's not fast food, it's fun food," says Yadira. "If you want to come in, just relax and enjoy yourself." For more information about Utca, visit their website or follow them on Twitter.